How the controversial Iron Ring sculpture could be seen as celebrating the suppression of Welsh uprisings was discussed by officials beforehand, emails obtained by Plaid Cymru have shown. The party said these show the Welsh Government knew the artwork would be seen as a celebration of oppression. But Economy Secretary Ken Skates claimed the concerns did not reach him. Plaid Cymru obtained the correspondence through the Freedom of Information Act. 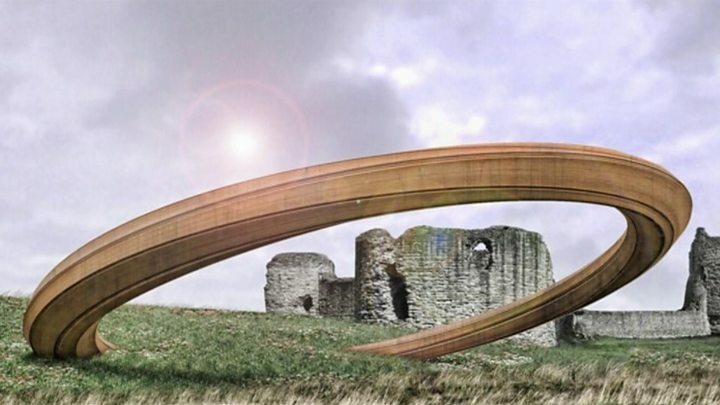 The plan to create an iron ring sculpture at Flint Castle were described as "insulting to Wales" when they were announced in July. It has now been scrapped. The winning design was selected by a panel following a nation-wide competition, and the architects said it demonstrated "the unstable nature of the crown". The emails, all sent in May, show a draft of a ministerial advice note drawn up for Economy Secretary Ken Skates that quoted the bid proposal for the sculpture which said: "It marks Flint Castle as the first of Wales' historic Iron Ring castles built by King Edward I to suppress Welsh uprisings, a project that was the most ambitious and concentrated building project in medieval Europe." It went on: "The sculpture symbolises a giant rusted crown representing the intimate relationship between the medieval monarchies of Europe and the castles that they built." It is not clear whether anything from the note published in the FOI was revised when it was finally sent to Mr Skates. In another email, an official comments: "I note that we will be celebrating the suppression of the Welsh People by King Edward I with this art installation." In a follow-up a further official wrote that the term "ring of iron" was coined in the 19th Century to describe the chain of castles built by Edward I after the first and the second Welsh wars of independence in the 13th Century. "These castles were used to cement Edward's successful campaigns and put an end to Welsh ambitions for independence from England once and for all. Flint was one of these castles," the official said. "So in effect some people may see the 'ring of iron' as some sort of reinforcement or celebration of this." The official added: "We might be able to challenge this with the inscriptions on the piece or by making it more Celtic in some way within the ring design itself". Image caption In one of the emails disclosed by Plaid Cymru, an official said: "I note that we will be celebrating the suppression of the Welsh people by King Edward I"
Plaid Cymru economy spokesman Adam Price said: "The Welsh Government were aware that this would be seen as a celebration of our oppression." "Short of being 'epic', this plan was embarrassing for the government and insulting to Wales," he added, calling on the cabinet secretary Mr Skates to apologise. However, Flint mayor Vicky Perfect has said local residents supported the plan for the iron ring as a tourist attraction, claiming most of the opposition came from people outside the area. Economy minister Ken Skates told BBC Wales: "The concerns didn't reach my desk. "However, officials I am content explored all of the concerns and presented an option that had gone through a panel that represented the best outcome of that procurement project." A Welsh Government spokeswoman said: "The merits and otherwise of all proposed artworks and sculptures for the Flintshire site were considered by a panel before a recommendation was made to the economy secretary. "We recognise the strength of feeling around this proposal which is why we took action to halt it. "Our focus now is to work with local people and partners in Flint on developments aimed at increasing visitor numbers and growing the local economy of the town, which will have the backing of the local community."